This was a very helpful graphic I found a while back. 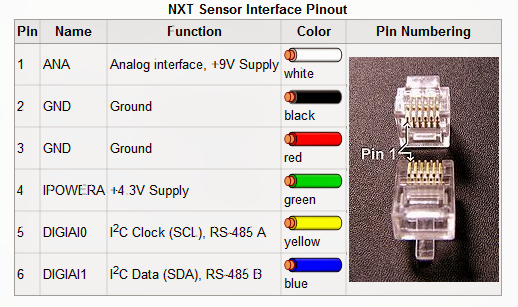 It shows which pins do what on the LEGO NXT cable connections. I also received a suggestion recommending this site: http://www.philohome.com/nxt.htm which has a lot of good information regarding NXT projects for users that want to take their NXT designs to a more advanced level. This site has good instructions and I would definitely recommend checking it out. Thanks Marc-Andre, I checked out the site. There is some very good information there. I'll update my post to suggest that site as well. It's from here: http://en.wikipedia.org/wiki/Lego_Mindstorms_NXT right? But i found it thx to your phrasing so thx! That is correct. I posted it because it's such a convenient reference. 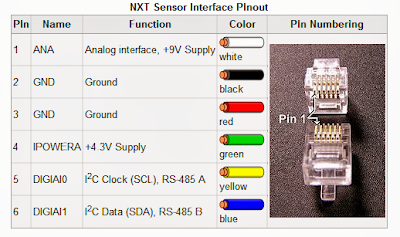 I've used it for setting up custom NXT output devices but there is obviously a lot more possibilities than that.